Rosenthal, a volunteer, is driving the scraps to Upper Marlboro, a town about a half hour south, where they can be donated to a county-run pilot composting program. “We have runaway climate change right now,” says Rosenthal, 58. “I’m doing this to reduce the greenhouse gases in our trash.” Decomposing food scraps in landfills are a major source of methane; these emissions can be reduced by composting rather than throwing away. Rosenthal and the New Deal Café are part of what many are calling the “new economy”: a worldwide collection of people-powered groups—cooperatives, nonprofits, bartering networks, time banks and other unconventional enterprises—organized around the aims of environmental sustainability, social and economic justice, and meeting the basic needs of communities rather than prioritizing profit. In recent years, Greenbelt has seen a surge of interest in “new economy” endeavors. Despite occasional false starts, community members have become involved in a number of such initiatives, from Rosenthal’s volunteer composting team to a cooperative community center. Greenbelt is not the only city where these ideas are taking off, but its “new” economy is unique in one way: It’s in fact quite old, going back 80 years. During the Depression, President Franklin Delano Roosevelt set up three “Greenbelt Towns”: Greenhills, Ohio; Greendale, Wis.; and Greenbelt, Md., a tree-lined city 13 miles northeast of Washington, D.C. These planned communities were intended to provide work for the unemployed and low-rent housing to the poor. In 1937, when Greenbelt was completed, 885 units of housing were made available. Potential residents had to meet a low-income requirement and demonstrate in an interview that they possessed the right community spirit. While the program’s accepted applicants represented a diversity of religions, all were white. The community-minded residents began to spontaneously organize their own clubs, and within a year, 35 such groups had sprung up. They included a camera club, scout troops, choral groups and a drama club. But Greenbelt’s backbone was to be cooperatives: organizations owned, controlled and operated for the benefit of their members—who may be workers, consumers (as in a food co-op) or residents (as in a housing co-op). Typically, each member buys a share at the same price, and—unlike in a typical corporation—decisions are made according to the principle of one member, one vote. Early Greenbelt co-ops include a federal credit union (a financial coop) and a newspaper, both of which exist to this day. Even children who heard their parents talk about cooperatives got in on the action, starting their own co-op to buy candy and school supplies: The Child Gum Drop Cooperative began within months of Greenbelt’s founding, with 92 children investing 10 cents a share. A Boston philanthropist provided initial funds to start Greenbelt Consumer Services (GCS), which operated a grocery store, a barber shop and other community enterprises. Residents formed the Greenbelt Cooperative, and were soon able to purchase GCS themselves. After the war, the federal government began to discuss selling the community, and in 1949 Congress passed a law mandating the houses be sold. In contrast to Greenhills and Greendale, which were bought by private interests, the residents of Greenbelt bought their own homes in 1952. They were enabled by their credit union, which emptied its stores (and even borrowed from another credit union) to provide loans for the residents to purchase their homes. Over the years, the Greenbelt Cooperative opened more businesses and expanded geographically, cooperatively operating a Scandinavian furniture store, drug store, beauty parlor, movie theater, laundry service, bus service, some gas stations and even a few shopping centers. In the late 1960s, the Greenbelt Cooperative increasingly shifted toward furniture, at that point its one money-making endeavor, but eventually even this went out of business. In 1984, residents formed the Greenbelt Consumers Cooperative (still operating today) to buy the town’s grocery store and pharmacy. Four years ago, Rosenthal helped to organize a meeting of Greenbelt residents who were interested in starting worker cooperatives. She placed an ad in the co-op newspaper and publicized the meeting on social media. Over a series of meetings, 40 or so people formed the Greenbelt Cooperative Incubator. Twenty-one ideas for potential cooperatives came out of these early meetings. One attendee called for a new thrift store. Others wanted to start a child-care cooperative. Still others wanted to support new community gardens. To help get off the ground, the Mothership applied for and received a grant from the Greenbelt Community Foundation—which invests in local projects aimed at building community—and attended a training by Jim Johnson of the Democracy at Work Network (DAWN) [and a member of the GEO Collective -ed.] in how to organize and maintain cooperatives. None of these ideas panned out exactly as planned. The child-care cooperative, for example, failed to find an affordable, safe building. Rosenthal lists four key lessons: not every idea is financially feasible; some ideas are ahead of their time; some ideas are better suited to grant-funded nonprofits; and that growing the volunteer base is an important part of spreading the new economy. Though the group’s initial ideas have yet to become new co-ops, Rosenthal says some of them have “morphed” into other community-oriented projects, in part thanks to cross-pollination between different groups. For instance, the Mothership members originally interested in starting a child-care coop have begun volunteering with the Cheseapeake Education, Arts and Research Society—an environmental nonprofit—on an after-school project aimed at teaching children permaculture gardening. As for the Old Greenbelt Theatre, a member of the Mothership successfully bid for a contract from the city to run it, as part of the community-based nonprofit Friends of Greenbelt Theatre. The nonprofit is exploring having the concession staff operate as a worker co-op, and residents are able to volunteer one day a week in exchange for a free movie. For now, Rosenthal herself is working with the city and fellow volunteers to expand composting. Most days, Joe Robbins parks his bike in front of the New Deal Café to load up on food scraps. New Deal workers fill the buckets with coffee grinds, potato peels and other vegetable matter. Robbins, a new Greenbelt resident who had been composting for 23 years in nearby Mount Rainer, then takes them a few hundred feet to Rosenthal’s garage. “I was looking for a way to contribute to the community, and Lore grabbed me,” Robbins explains. One cooperative did start from the Mothership’s community education efforts, though it wasn’t one of the original 21 ideas. The owners of The Greenbelt MakerSpace, a community education and activity center, had attended some of those early meetings on cooperatives. They brought the information back to the board, which agreed to go co-op. The business has 126 members who come together to “upcycle” goods, learn about knitting, work on robotics and pursue artistic projects. “It’s women creating together, like the old quilting bees,” says Cynthia Swan, a member of the space. 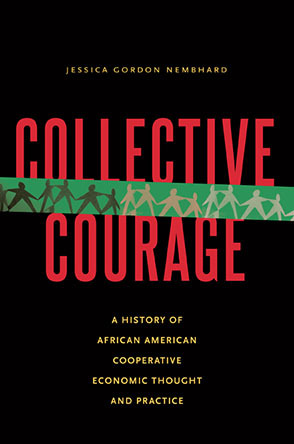 Ajowa Nzinga Ifateyo's A Co-op State of Mind: New York City Jumpstarts Worker Cooperatives, published by In These Times in September 2014, was included in the recently published book, The Age of Inequality: Corporate America's War on Working People - A Forty-Year Investigation by In These Times. The comprehensive book, published by Verso Books, features contributions from Noam Chomsky, Michelle Chen, Juan Gonzalez and others.